At first, my husband didn’t read this blog — at least, not regularly. He was more like a “check in every few months” type of reader. But when I gently told him that he might be missing major insights into my inner life, that some 300 readers might possibly know me better than my own husband, and that I might just post embarrassing stories about him, he subscribed to the blog feed. Now that he’s a regular reader, Erick is my most honest critic. 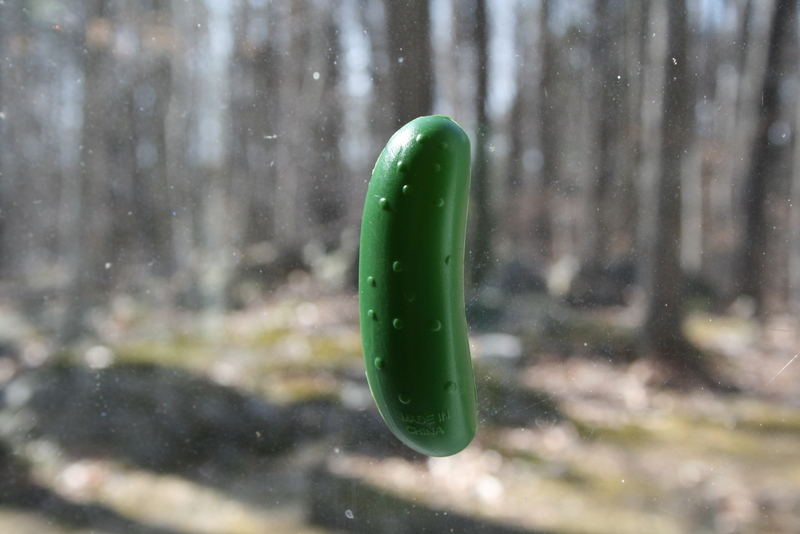 So, he tells me that things have been getting a little…heavy…on this blog lately. I know, I know: What’s WITH all this life and death and introspection?!? Where are the cute photos of our girls, the puppy updates (coming), the humorous anecdotes about our pest-control problems? All I can say is: those cycles of life and death that I’ve been writing about apply to blog topics, too. And what with autumn’s darker and colder weather, the butterfly that never hatched, and the backyard chicken massacre, lately I’ve been kind of on the death side of the cycle. But that’s about to change; the upswing is starting with this very post. Because, my friends, today I am writing to gloat — er, SHARE — about my latest craft projects! Those who’ve been reading for a while will recall that, when we moved to Vermont, my mother gave me her old sewing machine. Last winter, I decided to start becoming a craftier person by sewing some dresses for the girls. Well, my craftiness took a vacation for the summer. But now that it’s fall-becoming-winter, I’M BACK! It gets dark at about 5 PM now, and I’ve got to find something else to do around here at night. We seldom go out after dark, since that involves babysitters (i.e. MONEY) and driving down empty country roads with the brights on. We don’t have a TV, and there’s only so much reading and writing and cleaning a person can do. Bring on the crafts! Here’s the thing I’m most proud of: I didn’t use a pattern for any of the crafts below. They’re all things that I dreamed up in my head and then made real. Which is a lot of fun, and probably takes me to the next level of craftiness, don’t you think? We have a beige couch and beige chair in our living room, and I was feeling the need to inject a little color and fun into the place. 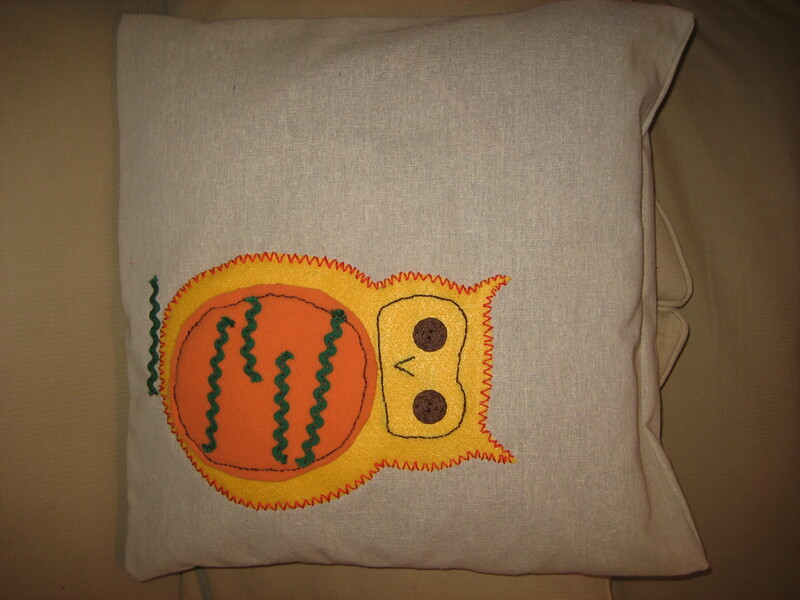 So, I decided to sew an owl pillow. Why an owl pillow? you ask. Well, we have a whole bunch of barred owls who live in the woods around our house. All night long we can hear them calling Who-who-who-whooooo! I love these owls; they look stately and wise, and whenever I hear them I think, You go, owls! Eat those mice!!! One of Fiona and Campbell’s best friends decided to have a Pirate Party when she turned five. 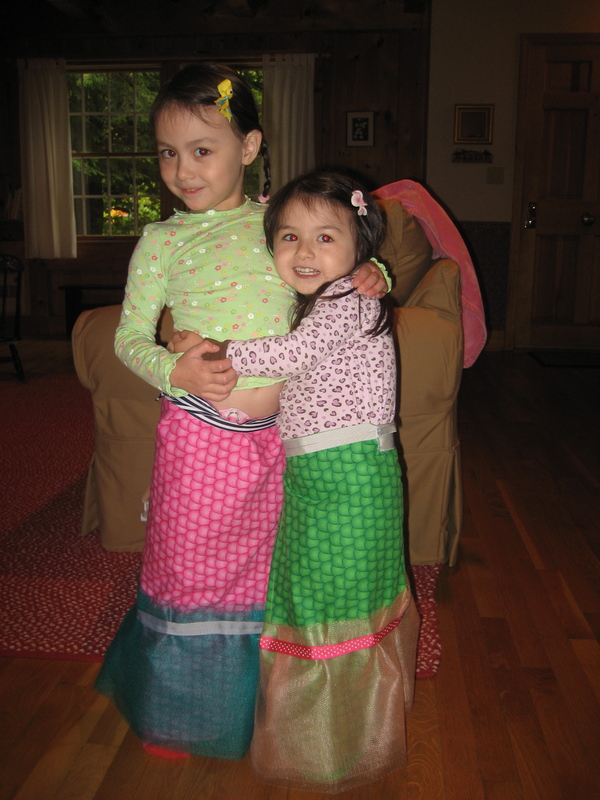 There was no way I was getting my girly-girls to dress up in pirate garb, but MERMAIDS are another story. I designed these fins to work like wrap skirts. They look great, are super-comfortable, and the girls have been wearing them for dress-up long after the party. I may have to make one for myself. Okay, so first of all, my girls call stuffed animals “stuffies.” I have no idea why; it’s certainly nothing Erick or I ever said. ANYWAY, when their 2-year-old cousin Aiden came to visit us in Vermont last summer, we weren’t sure if he’d like it here. Aiden lives in Orange County, CA, which is pretty much the epitome of planned suburbia. He lives near Disneyland. How would he handle our crazy Vermont-woods girls? He did great, and it turns out — huge surprise to all of us — that Aiden is NUTS about chickens. When we took him to Shelburne Farms, that kid was chasing after hens bigger than himself and catching them with his bare hands. He couldn’t get enough of our chicks (R.I.P. ), who were then still fluffy and cute in the brooder box in our garage. So, when I started thinking about a Christmas present for Aiden, which I do early because (a) I have only one nephew, and (b) I’m clueless and terrified at the prospect of gifts for BOYS, the obvious choice was: make him a chicken stuffie! That way, he could have his favorite part of Vermont in Orange County — only it would be much more hygienic (and hopefully have a happier outcome) than the real thing. 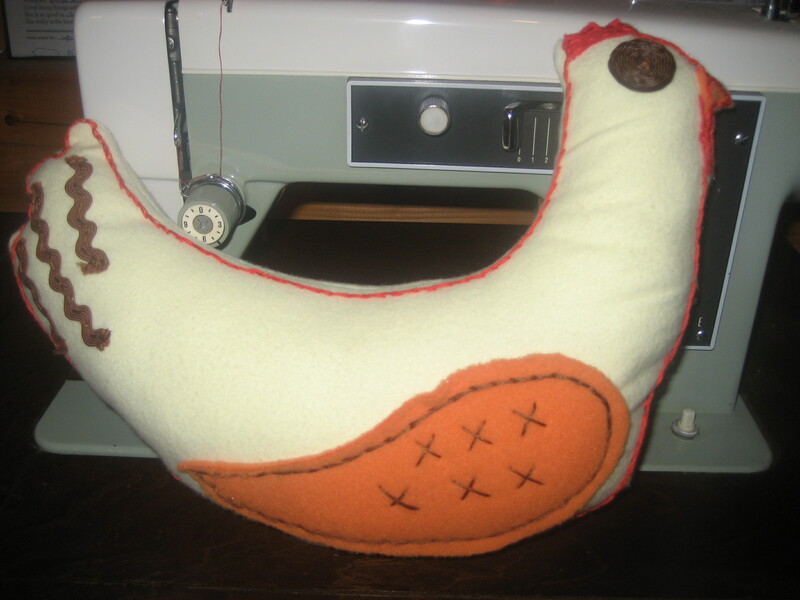 Of course, the predictable outcome, which I somehow failed to anticipate, was that once I showed it to the girls, Campbell said, “I don’t have a chicken stuffie.” So I suspect there may be a few more of these in my future. There you have it: a little peek at what I’ve been up to in the evenings. See? It’s not all deep thinking around here! 2) Is there meaning to my life? 3) How do I lead a purpose driven life? 4) We have a dog? That all sounds good, dear. I was also thinking we should have a nice long talk about our relationship…. Awe. How cute. Aiden will love the chicken stuffie! Turns out he’s also into goats, based on our last petting zoo outing. Same approach to the as with the chickens. Glad to see you are putting the sewing machine to good use. Talk to you tomorrow!